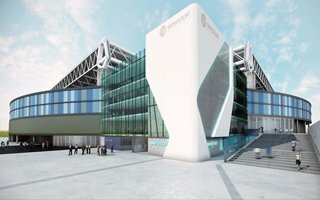 Barcelona’s most modern stadium will gain a new attraction as Espanyol announced cooperation with Windoor, operator of indoor wind tunnels. Skydiving indoors will be available in late 2016. Espanyol this week announced partnership with Windoor, company operating indoor vertical wind tunnels. Such tunnel will be created within the north-western corner of Power8 Stadium. The tunnel will allow visitors to experience skydiving indoors, boosting the stadium’s leisure offer. Espanyol’s latest attraction won’t be ready until late 2016 though, when it will transform the outer appearance of the stadium as in the below rendering. Windoor will occupy roughly 40% of the office building in north-western corner, leaving 1,800 square meters for other commercial partners.